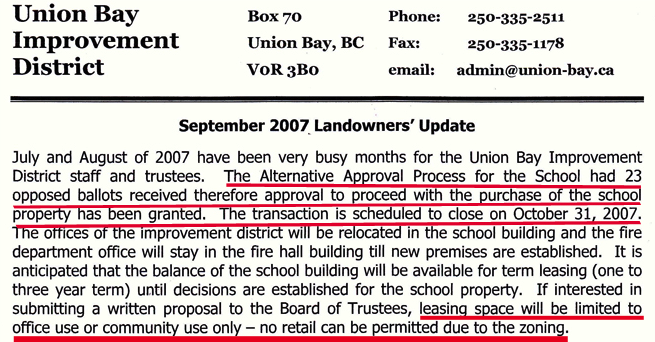 Union Bay Improvement District’s two law suits regarding the purchase of the school property is good reading. It reads as though poor innocent UBID did everything right and their only fault is expecting everyone else to do the same. For those of us who attended the meetings and have read the minutes of Board meetings where the school property was mentioned as early as March 2006, know the Board set its sights on that particular property as no other was ever presented to the community. I have no idea if the allegations against School District 71 as set out in the suit are accurate. My opinion regarding UBID’s handling of the purchase is yet another example of the inability to recognize when expertise is required. They are insulted when questioned and simply refuse to be accountable. The money that has been wasted in this community is staggering. Hope this goes to discoveries and trial. This property was forced on the community with the Board refusing to state what they were even going to use it for when asked at two meetings. I believe they wanted this property and nothing would have deterred them. UBID wanted it and that’s all that was important. Turns out, they had big plans for a 2 million dollar firehall and all kinds of renovations to the existing building. Money didn’t seem to be a problem and resale of the property wasn’t considered. So UBID was aware of restrictions. I also recall the community being advised it couldn’t be used for a day care due to restrictions. So what was UBID willing to accept in restrictions when making this purchase? Who decided a lawyer wasn’t required for a purchase over $600,000? Who decided they had the knowledge and skills to replace a lawyer for this purchase? Who decided not to tell the community? Don’t forget to vote this April 2013 for the impostor of your choice.